Review: Cecilia finds a letter addressed to her from her husband, instructing her to read it after his death. The problem? He is very much alive and when questioned about it, it is clear he does not want her to read it. Meanwhile...Tess is happily married-or so she thought until her husband and best friend (also cousin) announce they are in love. She leaves with her young son to her mother's house to clear her head. Meanwhile...Rachel's daughter was murdered years ago and she is happy to finally find joy in her life in the form of her young grandson. But when her son and his wife announce they are moving abroad for her job, she is devastated. When Cecelia reads her husband's letter, these women are impacted forever. Spring break is in 2 months and if you are searching for the perfect pool/beach read-this a good bet. 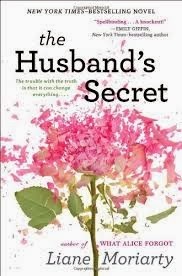 Told in alternating perspectives, The Husband's secret is predictable but oh so enjoyable. While many women may have a hard time identifying with type A-over achiever Cecelia, I can completely relate to her. Her reaction to her husband's secret seemed very genuine and makes you question what you would do and the impact it would have on everyone around you. My heart broke for Rachel and for her son, both victims in their own way. There was an afterwards of sorts at the end of the book that I wish wasn't included, but otherwise, fun read.